If Intel's new Ivy Bridge chips haven't exactly been a revelation on the desktop, the first of its new 7 Series chipsets have been a lot more satisfying. Previously, we've only had a taste of motherboards based on the premium Z77 chips, as seen in the Asus P8Z77-V Pro. But thanks to the new Asus P8H77-M Pro, it's time to take the Intel H77 for a spin. In simple terms, the H77 chipset is a slightly more mainstream and multimedia-orientated alternative to the full-featured Z77 platform. That means it shares most of the same features, including the well-established Intel LGA1155 socket and hence support for both older Sandy Bridge CPUs, such as the Core i5-2500K, and the latest Ivy Bridge specimens such as the Core i5-3570K. However, there are detail differences that you'll either be pretty relaxed about or regard as non-negotiable deal breakers, depending on the workloads your PC spools up. On the one hand, then, the Intel H77's feature set looks like a solid choice for 2D video buffs. On the other, it loses some capabilities that performance junkies demand. For gamers, as we'll see, it's a bit of a mixed bag. 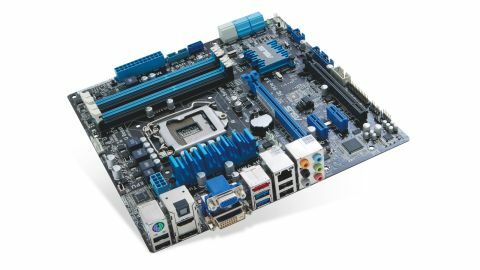 As for the Asus P8H77-M Pro, it's a compact MicroATX board that costs £90 in the UK and $130 in the US, and is nevertheless pretty generously specified, especially when it comes to graphics and video outputs. In that context, it doesn't really compete with Z77-based boards. Instead, the competition is the older generation of H67 efforts, including the Sapphire Pure Platinum H67 and Gigabyte H67MA-UD2H. The best way to understand the new H77 chipset, and therefore the Asus P8H77-M Pro, is as a direct replacement for the previous generation of H67 motherboards. Up to a point, everything is as you'd expect. Just like the H67, the H77's feature set certainly packs plenty of multimedia prowess. The Asus P8H77-M Pro adds a few of its own flourishes, too. But as ever with Intel's platforms, there are some frankly pretty arbitrary product differentiation measures to get your head around. It's all about which of the key Intel 7 Series features are offered by each of the new chipsets. The Z77 is the easiest to pin down, because it gets everything. For the H77, there are ticks next to the boxes for processor graphics support, SSD caching and USB 3.0, but a big fat cross next to CPU overclocking. You can't increase the CPU multiplier setting. Exactly how much that matters is somewhat subjective. But generally speaking, we don't much care for artificial limitations. It wouldn't cost Intel a penny to turn on overclocking for the H77, but that would make it harder for Intel to charge extra for the Z77. So it goes. Still, whatever your attitude is to Intel's tactics here, one thing is for sure. There's no point paying extra for a K Series processor with an unlocked multiplier if you're going with an H77 board. You simply won't be able to overclock it in any meaningful sense. It's also worth noting that the H77 supports Lucid Virtu MVP and therefore using both discrete graphics and Intel's integrated GPU in parallel. The main benefit of this is enabling access to the Quick Sync video transcode engine inside Intel's HD Graphics core. For the Asus P8H77-M Pro's part, it has the home theatre thing pretty nicely covered, thanks to a full compliment of video-out ports including VGA, DVI, HDMI and DisplayPort. The latter enables you to achieve desktop resolutions of up to 2,560 x 1,600. If nothing else, that gives you plenty of options as a temporary backup should your discrete graphics card bomb out.